This can be a particularly useful idea against opponents, myself included, who like to play the Exchange Variation, as it prevents the usual: 4 cd ed; 5 Bg5. White can try 4 Nf3 and then after 4 ... Nf6; 5 cd ed; 6 Bg5 but this rules out one of the most dangerous variations of the Exchange where White develops the knight on e2 rather than f3. 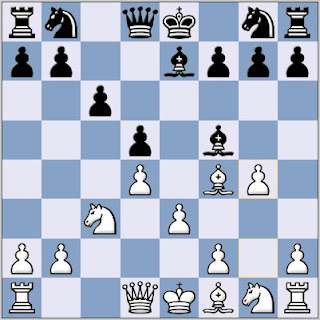 Alternatively, if White still wants to play the Exchange Variation, he can adopt a setup with the bishop developed to f4 rather than g5, i.e. 4 cd ed; 5 Bf4 c6. 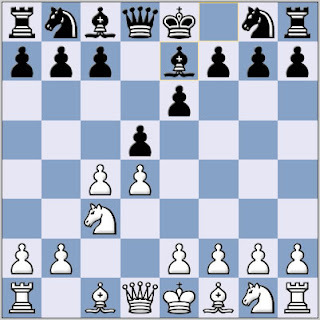 The light squared bishop can be a problem piece for Black in the Queen's Gambit, from f5 it is not only posted actively, but also stops White's standard attacking setup with Bd3 and Qc2. White can try his own move order refinement with 6 Qc2 instead of e3 to prevent 6 ... Bf5, but then Black has 6 ... g6 or 6 ... Bd6. So, his was my choice in my 3rd round encounter with Andy Lawson at Hartlepool. After Andy's reply, 7 ... Be6, I knew 8 h4 was playable but wild, and instead adopted Korchnoi's choice against Karpov of 8 h3, and my initiative was enough force an advantage as Andy went wrong close to time control. In the final round, Jimmy Simpson also played 3 ... Be7 against me. Suspecting he had specially prepared the line, and with me only needing a draw for the title, I adopted the 'safer' 4 Nf3 and went for a minority attack version of the Exchange Variation. Nice game and great comments.. I have Sadler's book and would also recommend it very highly. Lalic has a (short) chapter on this in his "QGD: Bg5 systems" (2000). It's called the Alatortsev variation, and does not seem to have any "easy" refutation. Grandmaster games are won on both sides.